In May of this year, an electrical fire caused significant damage to Tacoma Bible Presbyterian Church. The congregation chose to sell the building in the wake of the fire due to the exorbitant cost of repair and it has since been demolished to make way for a 5-story mixed use apartment building. Fortunately, Second Use had the opportunity to work with the developer, Rush Development, to salvage the uncharred remains of the space and preserve what history remained. Originally constructed in 1921-22 as a cathedral for the Ancient and Accepted Scottish Rite, a branch of the Masons, the church was originally modeled after the ‘architecture of the temple of King Solomon’ and was inspired by a mix of art deco, neoclassical, and art moderne design. It was later purchased and remodeled by the Tacoma Bible Presbyterian Church in 1937. Second Use salvaged materials from both eras, most spectacularly a pair of Masonic Plaster Statues that date back to 1921. The unnamed figure you see here was placed adjacent to a rams head column, situated in such a way as to solemnly cast its gaze toward the open cathedral, and was clearly crafted with care and meaningful intention. 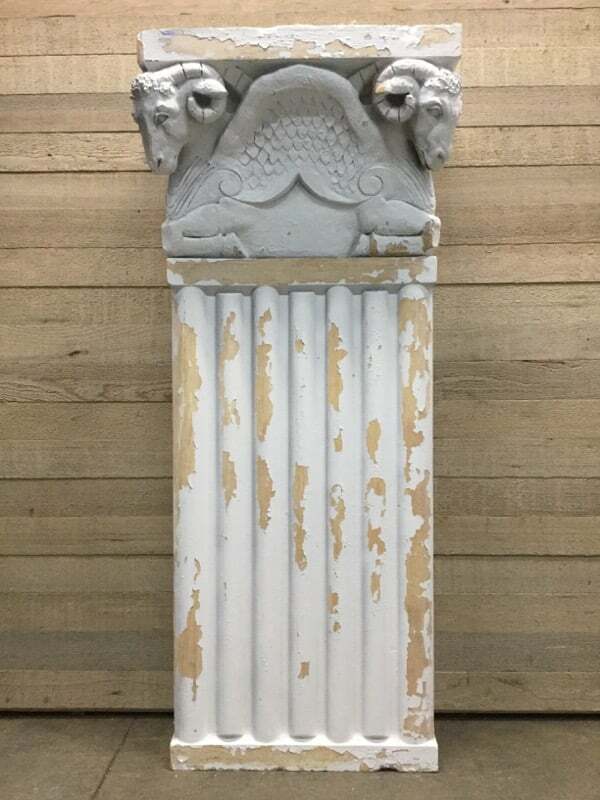 Stunning plaster column from the old Scottish Rite Temple near Wright Park in Tacoma. The temple was built from 1921 to ’22, and this original piece features the mythologically rich, cross-cultural symbol of the winged double headed ram. 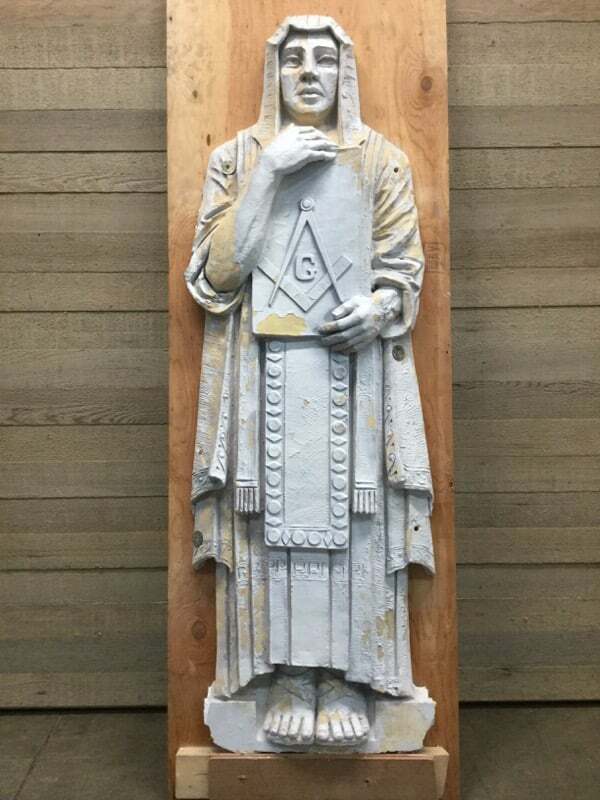 In place, it was situated adjacent to a plaster figure holding a tablet marked with the Freemason’s compass. Perched 40 feet in the air, the four plaster statues depicted an iconic rams head column and unnamed figure casting their gaze upon the open cathedral. Meticulously crafted and nearly a century old, they were too exquisite to go unsalvaged- even if that meant a two man mission that required racing against the demolition schedule with consecutive 15-hour work days. 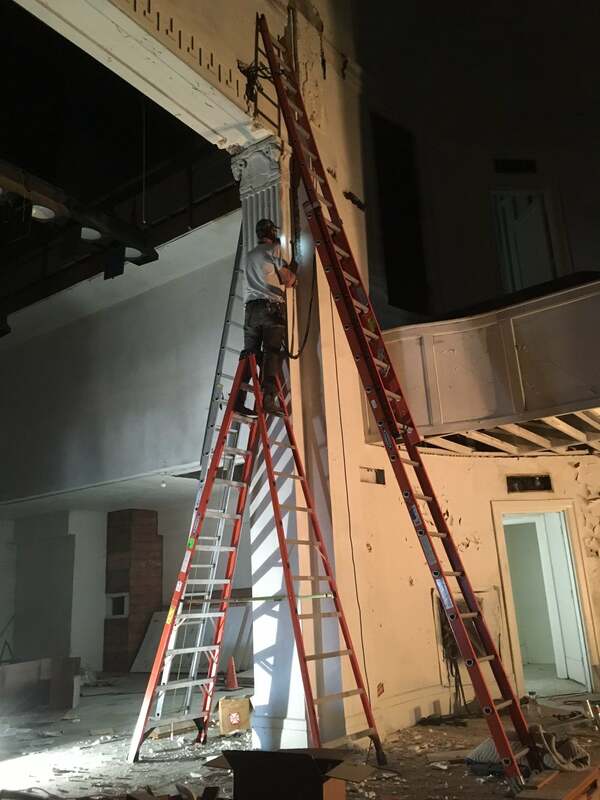 Second Use employees Maxx and Corey spent the bulk of their weekend on a network of ladders and custom built platforms in attempt to save the plaster statues. And it paid off- all four of them were successfully removed and remain in good condition given their age and exposure to the fire. Two of these plaster statues are currently for sale at our Tacoma location and represent not only a salvage success story, but a memento of our city’s past and the stories and lives our community is imbued with. 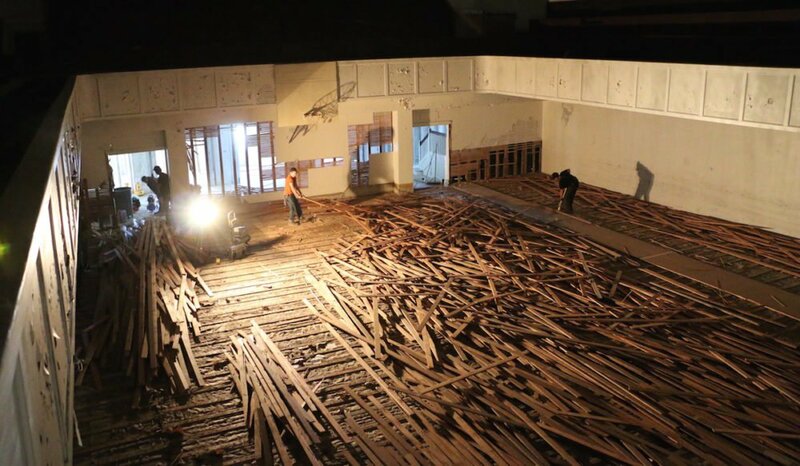 *Nearly 3,000 square feet of flooring was salvaged this is the GOOD STUFF! All clear vertical grain. Every once in awhile you’ll come across a painted board, but most is unpainted. Lengths vary from about 4′ up to 16′. Sold by the square foot. Sorry, no holds – come down to our shop to get first pick!